Are you interested in adding database processing to your existing web site? Are you starting a new e-business and need a site that is supported by a Microsoft database? Do you want to establish a web presence, and aren't certain what you need? We would be pleased to discuss web site alternatives with you that meet your business requirements. Just email us and we will contact you within 24 hours. 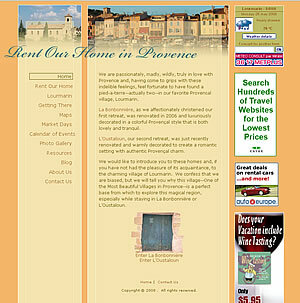 Promoting Provence as a destination, and the owners' apartment in particular as accommodation, this site includes an Access database to track reservation bookings, as well as store event calendar and photo gallery data. The Market Map page was coded entirely in CSS. The site incorporates a templated blog page from Blogger.com. This site is fairly straight-forward on the front-end: just six pages, one of which features an area in which users may sign up for a newsletter, and another of which features an embeded YouTube video. However, the back-end is more involved, providing database support for the newsletter, and allowing the site owner to oversee her subscriber list, preview her newsletter, and email newsletters either to individuals, or to all subscribers. This site is a rewrite of a pre-existing Joomla! site that site owners found difficult to maintain. The new site includes a back-end custom content management system that allows the site owners to modify the site's text and photos, including those in the slide show on the Home Page. Graphics have been updated to include the organization's logo. The site is supported by an Access database. Maureen Quirk is a wedding officiant who develops personalized ceremonies in consultation with couples, often including participation by children or other family members. 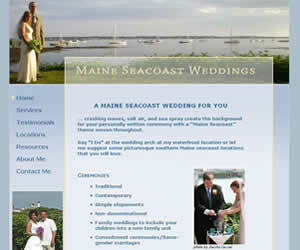 She wanted a site that would convey her love for and knowledge of the Maine seacoast and her flexibility in accommodating her clients' needs. 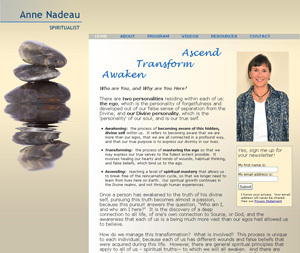 The site uses ASP.NET and some AJAX controls. 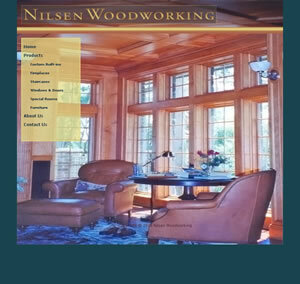 Dave Nilsen, master woodworker, presents examples of his work on this site. This site is a personal website for author and former Boston Globe editor, Jack Driscoll. It makes light use of php. This is an ASP.NET site for a golden retriever breeder. 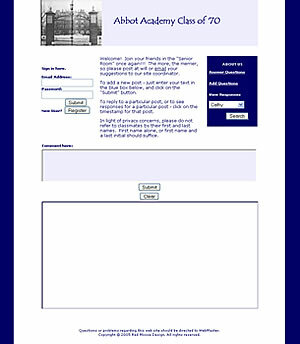 The Photo Gallery is supported by an Access database. 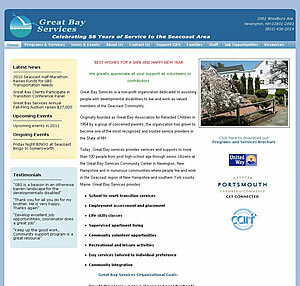 Graphic design of banners by Susan Kress Hamilton, Phineas, Portsmouth, NH. 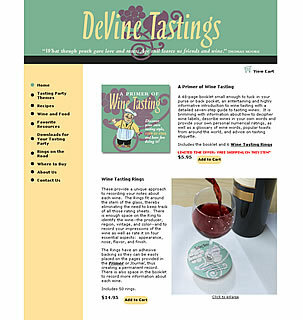 DeVine Tastings offers wine tasting party accessories, including a primer, hosting manual, and rings, for sale. The site includes recipes, free downloads, and information about wine, and integrates a PayPal shopping cart. Most of	this site is controlled by styles. 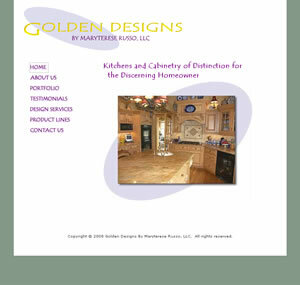 Heavily photographic, this site presents the services and products offered by Golden Designs, a kitchen and cabinetry design firm. Most of the Portfolio photographs were taken by our staff. 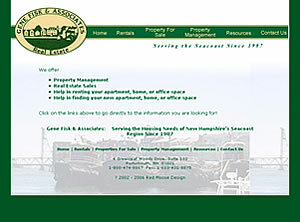 This site displays real estate data from an Access database. If the user clicks on the "Rentals" or "Property for Sale" links, he or she can select listings based on location, size, and/or availability. The application includes a back-end whereby the owner can maintain the database and upload photographs. 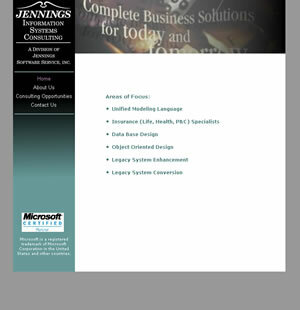 This is an html-only site for a consulting firm that specializes in legacy mainframe and object-oriented applications. 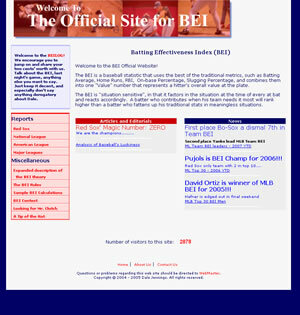 Founded by two die-hard Red Sox fans, this site features dozens of batting effectiveness reports on all National and American League players. Users may post comments to a bulletin board and respond to each other's posts. The site administrator enters home-page headlines via a data entry screen, and can monitor user registration and bulletin board posts. This site uses Access and ASP to maintain a bulletin board and a dynamic questionnaire that users may complete. Users must register in order to be able to view bulletin board posts or questionnaire responses, or to post to the bulletin board, answer the questionnaire, or add questions to the questionnaire.